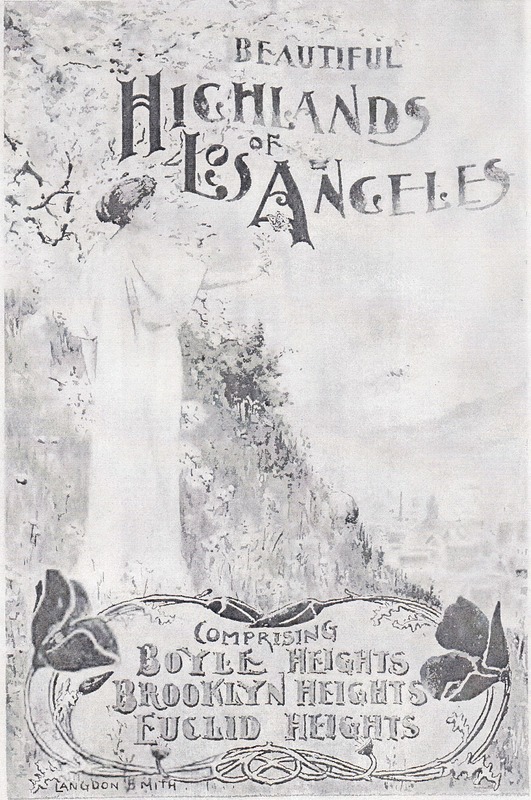 Recently, Boyle Heights Historical Society stalwart Rudy Martinez came across a pamphlet on an Internet search called Beautiful Highlands of Los Angeles, Comprising Boyle Heights, Brooklyn Heights, Euclid Heights. Apparently published in 1899 by the Ninth Ward Improvement Association (the city was then divided into "wards," a common designation in American cities then), this remarkable document was created to boost and promote Boyle Heights and its neighboring subdivisions for potential settlement and trade at a time when the region endured the lingering effects of the 1893 national economic depression and years of drought locally. Incidentally, Brooklyn Heights, subdivided in the late 1870s not long after Boyle Heights, was basically north of First Street. Euclid Heights, which was lesser-known and newer, probably developed not long before this publication was issued, was to the southeast along its namesake street and south of 4th Street. So, while its language and content were typically rosy and exaggerated, it does provide a snapshot of where the community was (or thought it ought to be) at the end of the nineteenth century when it was almost completely populated by middle and upper class Americans and Europeans. The pamphlet promoted the usual benefits accuring to a community that had it all, proximity to the business center of Los Angeles; a gorgeous climate; fine schools; an abundance of churches; growing fraternal organizations; and, of course, the energy and direction of the Ninth Ward Improvement Association, which offered its considered opinion that the area "seems to have been specially planned by nature as an ideal residential district" and that the area flourished because, "in addition to the superior natural advantages of the Heights, [there] is the enterprise of the people." Sections of the publication cover community founder William H. Workman, former mayor and soon-to-be treasurer of Los Angeles, and extoll his work in creating Boyle Heights; provide short biographical sketches of leading citizens, who, however, undoubtedly paid for the privilege of supplying both the information and photos of themselves and/or their residences; and essays on education, health advantages, fraternal organizations and clubs, churches, and rapid transit systems. Some of the period's purple prose pours out in profusion, such as this tidbit from the "Healthfulness" essay by Mrs. M. J. Henry, who exclaimed about, "those breezes, how sweet and fresh they blow across the hills, stirring the blood and making the pulses fly, driving away the languerous [sic] fever, and filling the lungs with pure air, expanding but never clogging that delicate mechanism, and so precluding pneumonia and kindred diseases." Whether or not the publication had the desired effect of bringing more residents and businesses to the east side, the community did certainly change dramatically in the following decades, though not likely as the Ninth Ward Improvement Association intended. Almost none of the featured persons in the document were ethnic minorities, but, by the 1920s, large populations of Japanese, blacks, Russians, Mexicans, and eastern European Jews settled in Boyle Heights, often because of restrictive covenants or less overt means of keeping them out of other areas of Los Angeles, as well as access to working class jobs in the city's industrial districts. Many of the people profiled in the 1899 publication, had they still been living two or three decades later, would most likely have left for the neighborhoods west or south of downtown. In any case, Beautiful Highlands of Los Angeles is one of untold numbers of the booster productions that burst out in the era. While some of its claims might have been true and others fanciful or, at least, embellished, it does provide a window into an aspect of Boyle Heights and surrounding areas in their early years. Future posts will deal with persons, residents, organizations and other aspects of this fascinating slice of Boyle Heights' history. Contribution by Paul R. Spitzzeri, Assistant Director, Workman and Temple Family Homestead Museum, City of Industry with thanks to Rudy Martinez for passing along the info on the publication.